Please feel free to print these instructions for the care of all of your Fleming Hybrids.. Since the Fleming Hardy Hibiscus™ and Fleming Filligree Crapemyrtle™ are so compact and in many cases dwarf, they are drought tolerant and actually thrive on less water than most plants and are an example of what sustainable landscaping is all about and means less work for you. They can also handle excessive water after they are established. Let them dry between waterings about 4-5" down before watering very well for vigorous growth. So remember, " In a Pot or in the Ground, Fleming's are the best around!" We send gallon size plants that are actively growing so you are assured multiple flowers the first year..
Let the soil dry all the way between waterings whether in a pot or in the ground a finger's length down in soil and give them a big drink ( You might even hear the drinking) when you do water so water runs all the way through roots and flushes them of excesses they don't need. 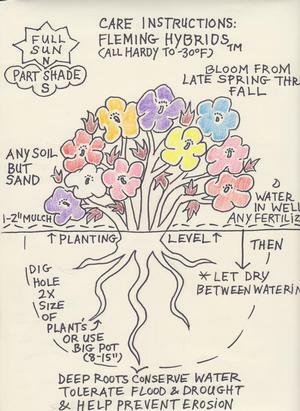 Any soil but all sand and add basic organic soil mix to planting soil if you prefer, but mainly remember to break up clay with spade and water in well and let dry as long as you can until soil is dry to touch apx 6 inches down before watering. May need to redirect sprinkler system for first few months till established. 1 or 2 inches of mulch is best at most so plants can still breath..
We use organic fertilizers such as Jobe's All Purpose Fertilizer Stakes, or Miracle Grow Organic. Please visit our favorite Organic Gardening sites: Gardens Alive or planetearthgardensupply.com We used to use Jack's fertilizer in the past and you only need to fertilize once a month or less..